Digitizing your supply chain has become a business imperative in order to compete effectively in the new age of Retail. New competitive pressures are forcing you to invest in new digital omnichannel models, which will inevitably force you to transform your supply chain to reduce costs, increase velocity and improve end-to-end transparency across the network. Enter the One Network Consumer-Driven Network. By leveraging One Network, you will be able to digitize your supply network, improve your on-shelf availability, increase your revenues, reduce your COGS, slash your inventories and gain visibility across your entire B2B network. Consumer Driven Network for Retail from One Network on Vimeo. Reduce your cost of goods sold? 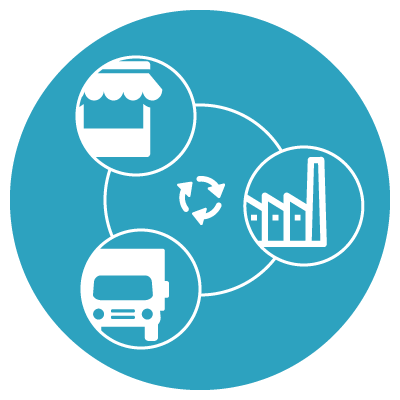 Improve the visibility and traceability across your entire supply chain? Improve your omnichannel fulfillment performance across all channels? If so, it is time for you to implement a Digital Supply Network! Achieve end-to-end visibility and transparency through your entire network. One Network: The Perfect Storm from One Network on Vimeo. You cannot build a house (or a network for that matter) without the right foundation, so let’s start there. Orchestrating multi-party processes on a single network platform requires some serious construction work – but the good news is that we did it all for you. Permissibility Model. 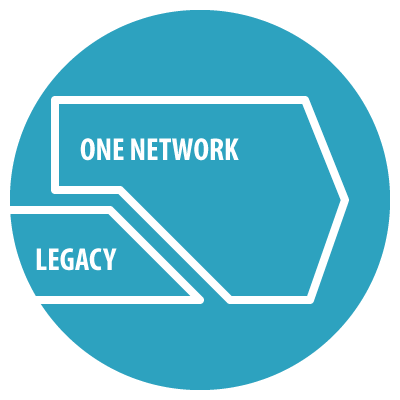 One Network has built a patented multi-party permissibility model that controls what everyone can see and do on the network with the highest levels of security. Community Data Model. You cannot operate a network without a single definition of the items, parties and locations. We take care of that for you, no matter which standards you and your partners use to share your data on the network. Modularity. All our applications can be used in a modular way to enable configurable multi-party processes on the network. You only deploy what you need. Interoperability. A digital supply network needs to connect to enterprise systems of record to enable integrated processes. This is why we built a deep expertise in integration technologies, and publish a public API will all our modules. Scalability. We deployed a horizontally scalable middle tier with grid computing architecture in order to be able to operate massive amounts of computation in real time. When we say real time, we mean it! Reliability. 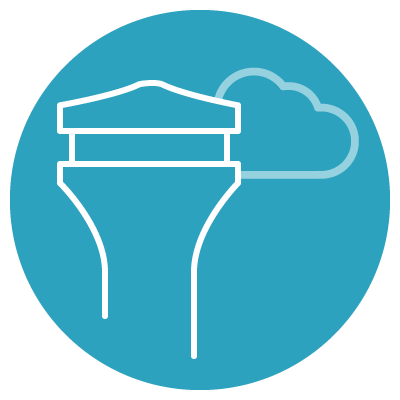 Our cloud is built on a highly redundant and reliable architecture, and we guarantee an industry best on time availability. Flexibility. Last but not least, the platform supports highly flexible and configurable business processes. Even better, we invite all our partners and customers to leverage our rich SDK to build additional capabilities on the ONE platform. The development tools on the platform enable the rapid development of innovative, supportable, Software-as-as-Service (SaaS) applications for business networks. So don’t hesitate to join our Developer Network (called DevNet) to learn and build on the ONE Platform, exchange ideas, leverage shareware, and market your apps! Join Developer Network (DevNet), our developer community, to learn and build on ONE Platform, exchange ideas, leverage shareware, and market your apps. Amplify the value of your services and applications by deploying on a large fast growing business network. The first level of digitization is to fully understand what is going on in your supply network, manage by exception, and resolve all the exceptions in real time. First things first, let’s model your supply network with all the nodes and lanes connecting all the parties (you, your customers, distributors, suppliers, carriers, etc.). Then let’s identify the standards that you want to measure for each node and lane (e.g. inventory levels, order capture to order shipment cycle time – you name it). Then let’s build the alerts that will get flagged every time one of these standards is not complied with. Simple enough. And, by the way, you can model your network differently at any level in your product hierarchy in case you have different routes to market from suppliers to stores. Some of your items may go through your retail distribution centers, some may be delivered direct to store by your DSD partners. Not a problem. We can handle it all. Then we go to work and work with you to connect all your B2B partners to the network. We are experts in any integration protocol (kind of hard to operate a network without it), and we also offer a portal interface to allow the not-so-technical parties to collaborate on the network. The result? Your team will be able to manage the entire supply network by exception, drill down into each exception to fully understand the issue, and resolve it there and then by using a built-in chat interface. Who said it was difficult to manage your entire supply network in real time? And we deliver the analytics to you as well, so you have all the insights to understand what is working and not working for every node and every lane on your network. Now you can work with your distributors, suppliers and carriers to improve the overall performance of the network. And the best of it? No endless debate with your supply chain partners. Why? Because everyone on the network uses the same single version of the truth! No more confusion about your data vs. their data. A single network is a beautiful thing. The second level of digitization allows you to optimize your multi-party processes across all the tiers included in your network definition. This Real-Time Sense and Respond approach is not new, yet retailers have not been able to implement it. Why? Because they rely solely on enterprise-centric capabilities that need to be connected across enterprises via EDI, spreadsheets or emails! This disconnected and siloed way of doing things is structurally flawed. It will deliver delays, frictions and inefficiencies that make the goal of Real-Time Sense and Respond impossible to achieve. 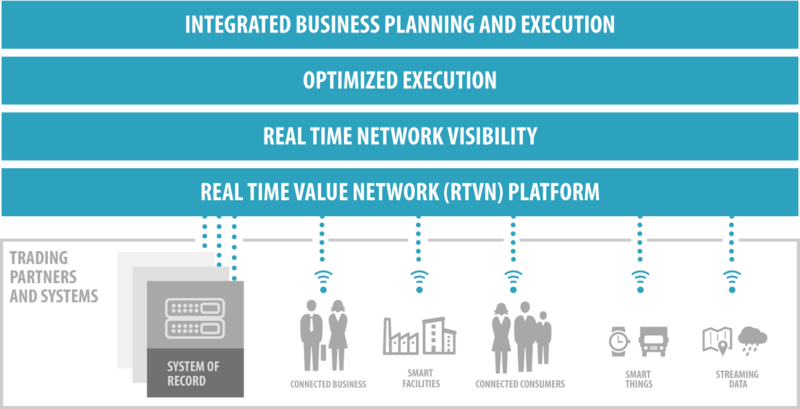 Digitizing your supply network by deploying the Optimized Execution capabilities of the One Network will allow you to deploy a true Real-Time Sense and Respond model. Finally. And you can start wherever you want based on your business needs. You need to improve your demand sensing accuracy? Check. You need to reduce your inventory levels? Check. You need to improve your DC operations? Check. You are in control. Operationally. You face a disruption to your business and you need to evaluate the impact on your financials. You can then take the appropriate action based on the nature of the disruption. Tactically. You can use what-if scenario planning to look for the best option to achieve your financial targets. Strategically. You can take the long term view and integrate the data into your strategic planning decisions related to, for example, capex planning and strategic sourcing. 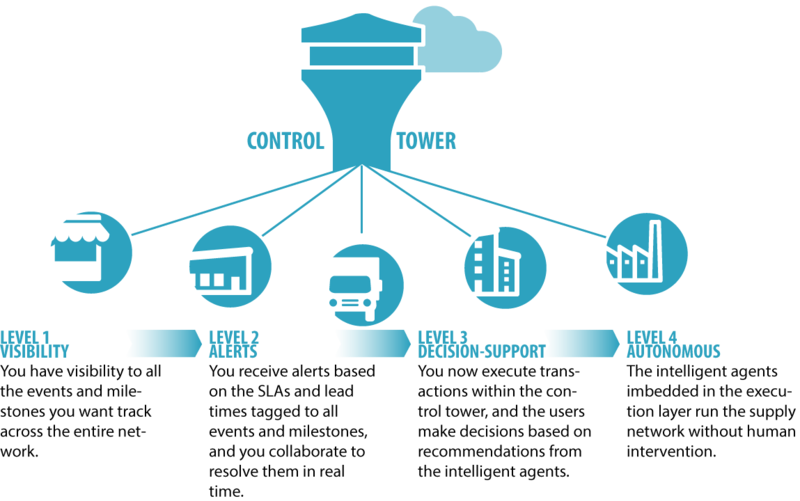 One Network enables all four levels of supply chain control tower deployment, from visibility, collaboration, autonomous decision-making to advanced cognitive capabilities. 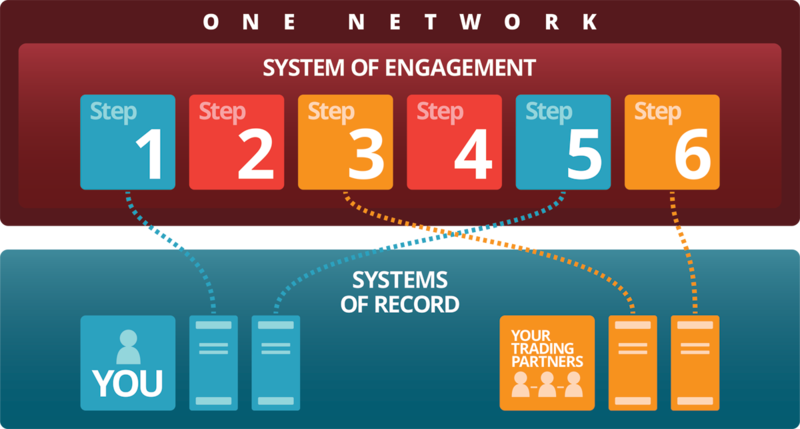 One Network’s Platform can be deployed as a System of Engagement on top of Enterprise Systems of Record. If and when it makes sense, ONE Platform can take on the functionality of legacy systems. This report explains a simple solution that dramatically boosts OTIF performance and enables significant benefits for both suppliers and retailer.